1) She got the world reading again. 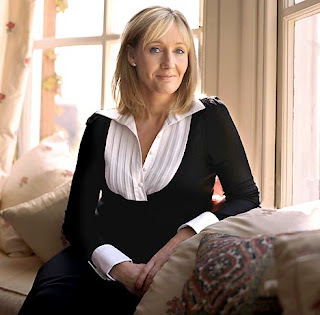 Before J.K. Rowling came along an overwhelming number of people had given up reading and it seemed books where losing to other forms of entertainment like movies, television, and video games. Especially in children, which really worried me. But when the Harry Potter books came out I heard, more times than I can remember, that people were getting into reading. And not only was it cool to read again, it was cool to carry around books larger than 1,000 pages. This went for adults and children. The Harry Potter series is the ONLY series my son has read it its entirety, which is saying a lot. And with this new-found love of reading, they went on to read other books and series. 2) This also inspired more writing, in my opinion. Not only did it make reading cool again, but the same with writing. I believe this made writing as a career a more viable option for many. 3) She wrote a terrific series. Was it perfect? No, but name one that is. It has it's flaws but I believe it is one of the most well-written works of fiction. Ever. In the last year I've attended two writing conferences. Nearly EVERY SINGLE CLASS has brought up Harry Potter as an example on how to do something right. Though she does have some criticism of her work, the praise far outweighs them. 4) She finished the series. I'm probably going to get some hate-mail (hate-comments) for this, but I do wish to be honest. Oh, I was so worried. My biggest fear after Harry Potter and the Half-Blood Prince was that she was going to get hit by a bus or something, and nobody would be able to finish it the way she had intended. This has happened with some of my favorite series (Dune and The Wheel of Time) and I was afraid it would happen with this. I know I'm coming across as petty and selfish. Sorry. 5) She finished it well. What a powerful ending, one of the best endings ever, in my (humble) opinion! I've invested myself into a lot of television shows (Lost) and book series (The Dark Tower, and to a degree The Hunger Games and Eragon) where they ended unsatisfactory. With those examples I'm left dumbfounded thinking, "That was it?" Not so with Harry Potter and the Deathly Hallows. It is the most satisfying endings I've ever read in a book. 6) She didn't turn weird. She wrote a (great) story and is happy with that. She isn't on television telling us how to live our lives. She isn't dressing like Lady GaGa. Best I can tell, all of this fame and fortune has not gone to her head like what happens to a lot of other people. She is an actual person first and a writer second. And she isn't resting on her laurels. She just launched Pottermore to help promote more reading and she is writing another book. Good for her! She announced the title today! (4/12) Sounds like a stand-alone about duplicity and rivalry. I was hoping for intrigue and suspense, but who knows. You should check harrypotterforwriters.blogspot.com. Susan Sipal offers a workshop from time to time (12 lessons) based on the writing of J.K. Rowling. I learned more from that workshop than from many, many workshops. I also learned appreciation for JKR's talent even more. Haha, yeah, a good friend of mine called it a sign that I wrote this right before it was announced.